The art of art, the glory of expression and the sunshine of the light of letters is simplicity. Nothing is better than simplicity . . . nothing can make up for excess or for the lack of definiteness. The ellipses are Whitman’s, an annoying orthographical tic that he thankfully suppresses later in his career. It’s just a comma. Never mind that. Not what I want to say. I want to end the week with two Longfellow vs. Whitman comparisons. First, the two poets, however different, share some goals, share them precisely. Both profoundly believe in the necessity of the creation of something called American poetry, something that is not European, that is not whatever is going on in English poetry. Longfellow solves the problem by writing on American subjects: Evangeline, The Song of Hiawatha, The Courtship of Miles Standish. “America” here includes French Canadians, pre-contact Native Americans, and, in other poems, slaves and sailors and anyone else Longfellow can think of. The founding of America – the Plymouth colony, the American Revolution - becomes a source of legends. Longfellow was not merely a deft and supple poet, but an innovator. I’ve both mocked and enjoyed his attempt to bring hexameter into English prosody, and now have to admit that his use of it in The Courtship of Miles Standish is an improvement on Evangeline. He wanted to expand what poetry could do, and how it was done, and he succeeded. Unless the comparison is relative, because he did not tear poetry down and build it up again. He did not push the language to the extremes of its resources like Walt Whitman or Emily Dickinson were doing at the same time. Nor did he extend the subject matter into forbidden and outrageous territory or new frontiers of obscurity like his peers Charles Baudelaire and Gérard de Nerval. Later poets and critics ranked poets according to the magnitude or importance of their innovations, so Longfellow falls behind. He does not vanish, but he lags. Second: Simplicity, complexity. Leaves of Grass is inexhaustibly complex. I know I’ll come back to it again and again. Whitman’s praise of simplicity is pure misdirection. In the 1855 Preface, Whitman describes, at length, the characteristics of “the great poet”: “The great poets are also to be known by the absence in them of tricks and by the justification of perfect personal candor,” for example. My working assumption at this point is that Whitman is describing himself, a great poet, without too much irony. Still, the idea that Leaves of Grass, even in this short, early version, lacks excess, or is perfectly definite, or is simple in any significant way, is absurd. Whitman reminds me of William Blake or Friedrich Hölderlin, world-creating poets so complex that readers scour fragments and drafts looking for clues to the meaning of specific words. Well, maybe it was all simple for Walt Whitman. Not for me. “The poems distilled from other poems will probably pass away,” Whitman writes near the end of the Preface. He might have been thinking of Longfellow, who was often criticized for being too European in his poetics (that he merely grafted American subjects onto European forms). The Song of Hiawatha is, I think, too simple to be a great poem. Its limits are reached too easily, its imagery is insufficiently rich, its ideas too easily grasped. The fact that I think this makes Leaves of Grass a greater poem says less about the poems than about my own aesthetic standards, which are received and very much of my time. More Whitman, later, after a break. More Longfellow, too. He’s no Walt Whitman, but he’s pretty good. First, please, just soak in the sheer beauty of Whitman’s verse. Read it alound, rolling the words around on your tongue. Plunge in. Revel in it. Think of it as a poetic spa treatment, a mud-seaweed wrap. “Banks, tariffs” - wonderful. Whitman is (in the 1855 edition) three-quarters of the way through “Song of Myself” at this point. The poem circles back on itself. Whitman is again reaffirming his omni-identity, but without the World Spirit mysticism found in other sections of the poem. Earlier, he sees everyone else, or hears them, or even is them, while here he is simply one of them. Now his interest is universal. I think this actually is a profound line. I resist “Song of Myself” when I read it – I know that I cannot become the wasp, I cannot become the rock. *** Then, late in the poem, Whitman’s position relaxes, and I see myself. What interests the rest interests me, too. Within, I admit, ordinary human limits. It’s an ideal. The yawp may have become overly barbaric – grammar has been expelled, sense soon to follow. Whitman needed a stop. This really is my favorite passage of Whitman, of Leaves of Grass, this ungainly, unpoetic, list. Fifteen years ago, I identified it as the perfect epigraph for my dissertation, which is just as boring as the choice suggests. I needed at least one good sentence in the dissertation, but not, you know, not too good. Plus, it has that inspirational motto, good enough to repeat: whatever interests the rest, interests me. * Frankly, I’ve completely confused myself about Whitman’s timeline. ** Before phone books, there were city directories, which had addresses in place of phone numbers. *** I'm actually thinking ofa scene in A Passage to India here. Fretting about The Song of Hiawatha -what is an "Indian epic"? Frederic Remington illustrated the 1891 edition of The Song of Hiawatha (1855). That’s the one I have been using, reprinted by David R. Godine in 2004. Remington’s illustrations of the story itself, one per canto, are pedestrian. More unusual, better, are the drawings on the right margin of every page: tools, clothing, animals, faces, picture writing, sometimes relevant to the text, but as often not. The objects are from Remington’s own collection, or from museums, and as a result are primarily modern Plains Indian artifacts. I think they add immeasurably to the attractiveness of the book itself, but they also highlight a problem with Longfellow’s poem. Longfellow wanted to write an “Indian epic.” What is an Indian epic? The Red Pipe-stone Quarry is a specific place, now a National Monument in Minnesota, that I hope to visit some day. Longfellow, like Remington, is describing a specific, existing object. But the quarry is also generalized, made part of a broader story, an “Indian” story. “Came the Mandans and Dacotahs, \ Came the Hurons and Ojibways” and so on. Longfellow’s Indian epic is constructed out of bits and pieces of the legends of many peoples, Iroquois and Ojibwa, primarily, all filtered through the writings of early proto-anthropologists. Is The Song of Hiawatha a diluted Ojibwa story, or a hodgepodge of many stories, or a genuine synthesis? The Red Pipe-stone Quarry really did have special significance for a widespread group of people, so it’s a great place to start. I’m not so sure that Longfellow succeeds as well everywhere else. The fact that his up-to-the-minute anthropological research has now been largely replaced just reminds me of the dangers of up-to-the-minuteness. I have no problem with any writer appropriating, as they say, the culture, language, beliefs, or religion of anyone else, nor do I put much value on respect. I love a good travesty. Take your shot, Mr. Poet, and let’s see how you do. The Song of Hiawatha was, politically, progressive, to introduce another anachronism. Sincere. Longfellow took Native American culture seriously, as did Frederic Remington. And that genuine interest was artistically transformed into – into what? In 1855, American readers were prepared to feel nobly interested in Native American culture and deeply moved by its eclipse, now that the conflict had moved a thousand miles west. In 1891, what reader doubted that Hiawatha really was gone, and could never return? In 2010 – I’m still thinking about it. So for some reason I thought it might be instructive to read Walt Whitman and Henry Longfellow together, specifically the first edition of Leaves of Grass and The Song of Hiawatha. Both were published in 1855. The latter became, possibly, the most popular long poem in the English language, for as long as long poems were popular. The former revolutionized American, Spanish, and Portuguese poetry – eventually. Genius versus talent. Freedom versus constraint. Future versus past. Art versus kitsch. What fun. Well, now I’m not so sure. I mean, I assumed that Hiawatha, Longfellow’s attempt at an authentic Native American epic, was better than its reputation, and it is. How much better – later, later. Let me set Whitman aside, too, and relate a story from my literary education. And so on, each foot given the same length, each stressed syllable pounded like a drum. Like a tom tom drum, you know, like Indians play. I think the real lesson was simply that meter exists, so a level of exaggeration was understandable. Those pallid guests are ghosts; this is from one of the weirdest and to me most interesting parts of the story. If this were prose, it would sound odd, but how odd? “And whenever Hiawatha came from fishing or from hunting, when the evening meal was ready, and the food had been divided” and so on. 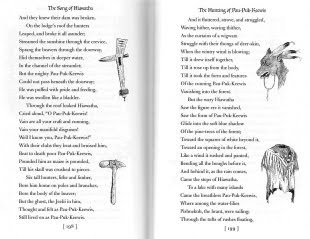 As prose, the filler becomes more visible to me – “from fishing or hunting” would be better – and maybe the clauses should be rearranged a little, but the rhythm is not particularly insistent. Whatever problems The Song of Hiawatha has, it is not kitsch. The subject matter is treated respectfully, the meter complements the subject, and the versification is expert. It was a pleasure to read. I read Leaves of Grass with furrowed brow; with Hiawatha I am calm and relaxed. Ah - perhaps that’s the problem. The question is not: Will I (meaning, you) read Herman Melville’s massive epic poem Clarel: A Poem and Pilgrimage in the Holy Land (1876) for The Unstructured Clarel Readalong, hosted by bibliographing nicole, but rather: Can I (you!) stand to wait until the end of August? I know, I know – me too! I’m glad we all agree. Naught of your new world’s chanticleer. A little queer! Twenty years earlier, The Confidence Man had marked Melville’s retirement from prose fiction. He kept writing poems, though, a massive quantity of verse, much of it contained in the four cantos of Clarel, based loosely on Melville’s 1856 trip to Palestine. Can that be right, nicole, that this is the longest American poem? Some lunatic must have surpassed it. Maybe it’s the longest published American poem. As for length, it’s a mere five hundred (500) pages in the Northwestern-Newberry edition which nicole and I will both be using. That’s not counting the additional four hundred (400) pages of apparatus, which includes a one hundred (100) page essay by Walter Bezanson that is apparently essential, so be sure to build that in to your schedule. Poor Melville. No one read this poem for decades. Melville himself said it was “eminently adapted for unpopularity.” I’ll bet he was right about that – he was a clever fellow. I have been pulling quotations from the Library of America American Poetry: The Nineteenth Century, Volume Two, which excerpts thirty pages of Clarel. The title of the post is Canto I, Book 1, line 173. That growing strangeness is what I hope will happen as I read Clarel. What I fear will happen is that the book will be completely incomprehensible. More American poetry, all this week. I’ve got to prepare for Clarel. Gonna be a dang hard book. For some reason, I have been claiming that Mary Barton was published in 1849, which is wrong. October 1848, that’s the right answer, amidst revolution and Communism and so on. Good timing. I don’t really know that Gaskell was the first writer to treat factory workers in the manner she did, sympathetically and, in some sense, realistically. I doubt it. Maybe Mary Barton is simply the first canonical book of its type. It’s the first I know. 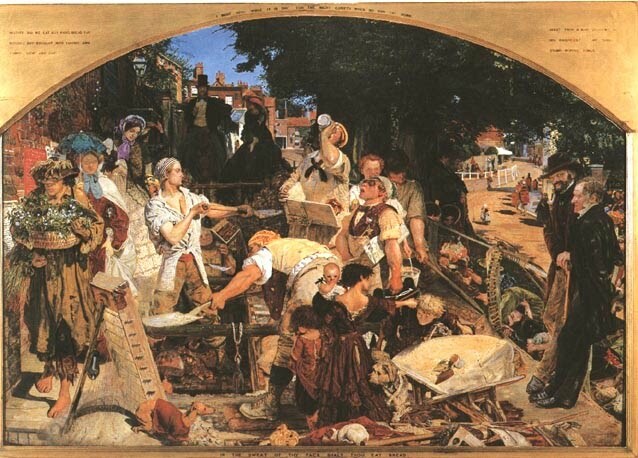 Charles Dickens introduces the working class, the factory class, for the first time in The Old Curiosity Shop (1841), but he presents them almost abstractly, in a sort of fantasy setting, like something from The Pilgrim’s Progress or Dante. I called it an “industrial apocalypse” – wrathful monsters and black vomit and starved children. It’s a powerful passage, but a lot of distance is built in, like a funhouse exhibit. It's not so easy to see any actual people behind the expert rhetoric. Dickens returns to the subject in the early part of David Copperfield, a book I have not read, but probably should. Is it any good? 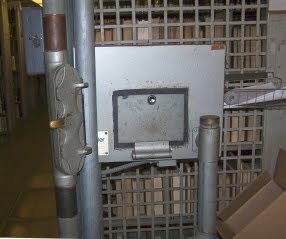 I recently read that Dickens told no one, no one at all, that he himself had worked in the blacking factory as a child. Is that true? Anyway, David Copperfield began serialization in March 1849. How much had he learned from Gaskell? Maybe nothing. I know of one other 1849 novel that has, in just one scene, an uncanny resemblance to Mary Barton. Had Herman Melville read Gaskell? One of the early deathbed scenes in Mary Barton, in the “Poverty and Death” chapter I mentioned a couple of days ago, takes place in a dark, stinking cellar. The husband is dying from typhoid, and the woman and baby are literally starving. One paragraph tells us how John Barton and his friend feed the family drop by drop, like modern aid workers. Another paragraph describes the “back apartment” of the cellar, “down which dropped the moisture from pigsties, and worse abominations,” and for which the family “paid threepence more for having two rooms” (64). Surrounded as we are by the wants and woes of our fellowmen, and yet given to follow our own pleasures, regardless of their pains, are we not like people sitting up with a corpse, and making merry in the house of the dead? The author of Mary Barton would not express herself so grotesquely, or vividly, and concludes her novel on an idealistic note, while for Melville, the episode is simply one piece of the moral development of his hero. But both Gaskell and Melville are asking for an extension of our sympathy. A couple of things to say. First, Gaskell is not exactly Flaubert here, is she? Le mot ordinaire is more common than le mot juste. But I beg the reader to remember Cranford’s butter-and-string passage, the greatest butter-and-string passage in world literature. Second, not every chapter begins with an exact placement in time. Maybe no more than one in four. Enough, though, that a device that at first seems clumsy becomes an element of Gaskell’s style. This is how, consistently, this story is going to be told. One perverse effect is that it slowed my reading – if another year is about to pass, that chapter can wait until tomorrow, can’t it? Towards the middle of the day she could no longer evade the body's craving want of rest and refreshment; but the rest was taken in a spirit vault, and the refreshment was a glass of gin. There’s the specific time again – well, I have no trouble calling this good writing. The euphonious cliché (“rest and refreshment”) that ends the first phrase is expertly dismantled in the second. Eighteenth-century critics like Samuel Johnson often talk about “well-balanced periods,” and I seldom know just what they mean, but I believe they mean sentences like this one of Gaskell’s. That’s also an entire paragraph. I read it with a strong accent on each syllable, with a pause for the weak beat. Hey, it's another time-setting sentence. I just noticed that, I swear. There are worse-written books than Mary Barton. But Gaskell sure gets better. Mary Barton is almost unrelievedly grim through its first half (and not a lot cheerier later). Unemployment, fires, fevers, alcoholism, drug addiction, senility. One character goes blind; another goes deaf and then goes blind. And then dies. The number of deathbed scenes is extraordinary, but purposeful. The repetition of the scene allows Gaskell to catalogue and develop one of her Big Ideas – the importance of consolation. This scene comes early in the novel, in the light and frothy chapter titled “Poverty and Death.” Mary does not know how to console. Her own tears come from she knows not where (self-pity, partly), but they are somehow comforting to the bereaved widow, even though it is not clear that they mean anything in particular. Some children die in the very next chapter. Mary again can only offer comfort mechanically, for which I hardly blame her. Other characters seem to offer consolation more naturally. Most simply, the novel is about how a woman loses her adolescent self-absorption and learns to regard others. Her father takes the reverse path – he turns inward over the course of the book, with disastrous results. His tragedy is his loss of sympathy. In the idealistic end, all of the right characters learn to understand each other at just the right time. That’s the story Gaskell is trying to tell. That’s the Christian message underlying the book, as I understand – all men are brothers, yes, but our sense of connection requires continual effort. All women are sisters, too, a theme Gaskell returns to in everything of hers I’ve read. Mary Barton uses the word "sympathy" or a variation more than any novel I know. Another piece of The Sympathy Project. Rebecca Reid points out a difficult feature of the novel’s structure. The first half or so seems to represent something like ordinary (miserable) life, and does not have much of a story. The second half, surprisingly, becomes a proto-detective novel and courtroom novel. Yet the thematic complexity of the book lies in the first part, while the more zippy second half is altogether simpler. Another two hundred pages of ordinary life might have been a trial tot he reader, but the more exciting plot, the trial to the characters, tells us little we didn’t know. The novel is at first slow and dull, but rich. Then it becomes quick and lively, but thin. Sort of odd. Badly balanced. The post’s title is from Chapter 35. This is "Work" (1852-65) by Ford Madox Brown, available for perusal in the City Art Gallery, Manchester. Image, with much other information, from The Victorian Web. I know there is too much detail in this complicated image to see what's going on. In the center, we have some honorable, ordinary workmen, and, for some reason, several dogs. Behind the workers are a number of representatives of the non-working class, the poshies - a mounted gentleman and his wife, a cute girl in a pretty dress, another woman distributing religious tracts. To the left is a ragged flower-seller. And to the right - see the smiling fellow with the hat and cane and beard? - is Thomas Carlyle himself, Victorian patron saint of Work. It has been written, 'an endless significance lies in Work;' a man perfects himself by working. Foul jungles are cleared away, fair seedfields rise instead, and stately cities; and withal the man himself first ceases to be a jungle and foul unwholesome desert thereby. The man is now a man. The blessed glow of Labour in him, is it not as purifying fire, wherein all poison is burnt up, and of sour smoke itself there is made bright blessed flame! I think it is fair to replace the exclamation with a question mark and reply “Um, no.” But for now, I won’t argue with Carlyle. Work is inherently virtuous and meaningful, even heroic. Mary Barton, published in 1848, is set during the economic hard times of 1839, the period of central Carlyle works like “Chartism” and Past and Present, his diagnosis of the Condition of England. Not that Gaskell does not have her own ideas, but Mary Barton is suffused with Carlyle. Carlyle provided one key to understanding what, exactly, Gaskell wanted, or wanted her readers to want. The lack of work eventually perverts and destroys John. A quite different lack of work also ruins a young gentleman who pursues the pretty Mary Barton – he can dally with her not simply because he is rich, but because he is “unfettered by work-hours” (Ch. 7, 80). The Carlylean echo here is not simply the celebration of work itself, but its separation from money. Gaskell brings out the Marxist in me at this point, the pure materialist – higher pay for the workers, I say! But I’m less convinced of the inherent meaning of work, and Gaskell and Carlyle believe, I think, that whatever material changes are necessary will follow the spiritual changes, somehow. The argument is made unnovelistically explicit at the very end of the book, when it is claimed that what John really wanted from his employers was not money, or improved working conditions, but that they would care about him, really care. He wanted nothing more than sympathy. “Sympathy” is the guiding word of Mary Barton. It’s all about sympathy. More sympathy tomorrow. Page numbers from the Penguin Classics edition, by the way. Fiction writers are such liars. That title is from Elizabeth Gaskell’s Preface to her first novel, Mary Barton (1848), a novel at times fascinating, often aggravating, and occasionally dull. Yet it is, I now see, an Essential Victorian Text. If only it were a better novel. Well, sometimes you gets the one thing, and sometimes you gets t’other. I’ll try to avoid going on and on and on about the aggravating and dullish parts. It was a relief to learn that the single worst chapter in the novel, genuinely bad, was forced on Gaskell by her publisher. Same thing happened to John Galt twenty-five years earlier, leading to the one bad bit of The Entail. That willfully naïve preface was a publisher’s demand as well. Writers, when cranky, are not often at their best. I at times could hardly believe that the first chapters of Cranford, light and sparkly and trickily rich, were only two years in the future. Gaskell learned fast. Or, she found a style she thought was appropriate for the grim Mary Barton and stuck with it, for better and worse. Eh, it’s a first novel with a lot of typical first novel problems. The amazing thing is what Gaskell does well, which is to tie together so many Important Victorian Themes that one wonders if the novel had been commissioned by time traveling literature professors. I’ll make a list, for my own benefit. - Manchester. I don’t know if this is the first novel set out in the new industrial cities. It’s the earliest one I know. But in 1848 they were not really so new anymore, so it was about time. This single innovation, writing a novel about working class Mancunians, is by itself worthwhile. The Manchester of Mary Barton is unfortunately not imagined at the artistic level of, say, the London of Dombey and Son (1847) or the Cranford of Cranford, but I thought it was sufficiently real. It does not feel like a transplanted London, at least. - Gaskell’s working class characters are her own, too, not reworked Dickens. Gaskell sentimentalizes them in some ways, but it’s her own sentimentality, something new. And Gaskell has almost no mediating characters, meaning we spend our time with the seamstress Mary Barton and her weaver father John on their own terms, in their own lives, not through the eyes of a more "respectable" character. - And as soon as I write that, I realize that it is not true. The respectable mediator is our narrator, who I’ll call Elizabeth Gaskell, who is endlessly intrusive, reassuring us that we can spend our time with these questionable people. The narrator is so weird in places that I sometimes wondered if I was reading the novel correctly. - A prostitute is treated with a great deal of sympathy, which I’m told is new. - Good or bad, Mary Barton is a political novel with a serious purpose. The reader, it is clear, is meant to be changed by the novel, by knowing more about these people. I assume that much of this effect is lost on the modern reader. The argument – the political argument – is odd, too. Despite some fascinating echoes of Marx (the Communist Manifesto appeared a few months earlier) and plenty of Thomas Carlyle, the change Gaskell wants is fundamentally Christian. I found this hard to understand, at first, but Gaskell led me through the argument, successfully. She knew plenty about Political Economy. Well, this is plenty vague to anyone who has not read the book. I’ll spend part of the week making some sort of argument about Mary Barton. So, a list of short Russian books. The rules are: short = less than 300 pages, acknowledging that “page” is itself vague. The 19th century only, although the results are no different for 20th century Russian literature. Lyric poetry (short!) omitted, narrative poetry included. Most importantly, only the really good stuff, the best, so no second-stringers like Vladimir Odoevsky (whose books are short). Please correct and amend. I’m sure I’ve forgotten something. Alexander Pushkin: The greatest Russian poet, the wellspring of Russian literature, wrote short books, exclusively. Essential reading: the tragedy Boris Godunov (1825), the short stories in The Tales of Belkin (1831), “The Queen of Spades” (1834), the short historical novel The Captain’s Daughter (1837), the novel in verse Eugene Onegin (begun in 1823), and a sheath of narrative poems and verse plays. Mozart and Salieri (1830) and The Stone Guest (1830), a version of the Don Juan story, are my favorites, but it’s a rich list. All short. Mikhail Lermontov: Only short books. The semi-novel A Hero of Our Time (1840) and a number of narrative poems as good as Pushkin’s. “The Demon” (also 1840?) is better. Nikolai Gogol: Extraordinary short stories, especially “The Nose”(1836) and “The Overcoat” (1842). A play of similar quality, The Government Inspector (1836). I love that play. And then the Greatest Novel of the First Half of the 19th Century, in any language, Dead Souls (1842). I see a complication here – the Penguin Classics edition is over 400 pages, Not Short, although Not Long. Does it include the unfinished Part II? Forget Part II. Ignore it. Part I is complete (and short). Keen observers may object, at this point, that I am basically just listing every great work of Russian literature. Yes! Because they’re short. We’re halfway through the 19th century now. Ivan Turgenev: He specialized in novellas. Almost everything he wrote is short. The Chekhovian play A Month in the Country (1850), the novels and stories Rudin (1855), The Home of the Gentry (1859), On the Eve (1860), First Love (1860), Fathers and Sons (1862), Smoke (1867), Spring Torrents (1867). The novel Virgin Soil is Not Short, and the collection of stories A Sportsmen’s Sketches (it has many other, similar translated titles) verges on Long. Still, a huge amount of first-rate, short Turgenev. Sergei Aksakov is still read for three marvelous volumes of memoirs: the 200 page A Russian Gentleman (1856), the 300 page Years of Childhood (1858), and the 150 page A Russian Schoolboy (1856). Alexander Ostrovsky was a playwright. Plays are short. The Storm or The Thunderstorm (1860) seems to be the best known. I want to skip Tolstoy and Dostoevsky for a minute, and sweep together the rest of the latter part of the century: Nikolai Leskov, Anton Chekhov, Leonid Andreyev, and Ivan Bunin. All are known, almost exclusively known, for short stories or plays or both. Those so-called short stories often extend to 100 pages. Still: short. Leo Tolstoy and Fyodor Dostoevsky wrote immensely long novels. They also wrote short books that are just as good as their longer work. I could simply refer interested readers to The Great Short Works of Leo Tolstoy and The Great Short Works of Dostoevsky, essential, accurately titled collections. More specifically: Notes from the Underground (1864) is not inferior Dostoevsky, or starter Dostoevsky. It is central, great, and so on. Not to be missed by the reader serious about Dostoevsky, no more or less than Crime and Punishment. Similarly, The Death of Ivan Ilych (1886) and Hadji Murad (1904!) are as important, as well-written as War and Peace or Anna Karenina. Maybe not as complex; nowhere near as long. The long, the really long Russian books, amount to: three Tolstoy novels, five Dostoevsky novels, and Alexander Herzen’s My Past and Thoughts. Add in the substantially shorter, but Not Short, Oblomov of Goncharov, and we’re up to ten long books. Please compare this count to the major French or English literature of the century. Not to the Germans – this was the age of the novella, so their literature will average out even shorter. All right, that’s off my chest. Please let me know where I’m wrong. Here’s Rebecca Reid, with a long collection of short Russian literature. Anyone who visits me via an RSS reader should hop over for a minute to see the redesigned weeding site. Worth it, I swears. For advice on weeding, I turned to the greatest literary lawncare manual, Leaves of Grass, the root of America’s desire for the perfect lawn. Just the first, 1855 edition, since I am only an Amateur Weeder. For a classic of this stature, the guidelines for weeding are surprisingly vague. It becomes clear that Whitman’s ideal lawn is somewhat different from modern standards. I swear I see now that everything has an eternal soul! The trees have, rooted in the ground . . . the weeds of the sea have . . . . the animals. An ambiguity – how about the weeds of the land, which are the ones I’m harrowing? The irony, however weak, is that I hardly care about the lawn, and positively like weeds. I’m simply trying to bash a neglected lawn into some form meeting the community standard, which, fortunately, is not too high. What is more beautiful, I ask you, than a field of dandelions, in bloom or seed? I love dandelions. Yet, rip rip rip, there they go. The pleasant, cabbagey broadleaf plantain is my great enemy, now. I’m not sure why. What a handsome plant. What noble antennae. Be intricate as it and up to aa it moves? Quhile still the firmament it proves. Just what I have been asking. 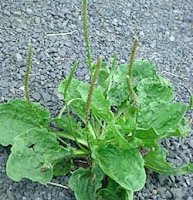 How can I grapple with the broadleaf plantain, intricate as it is? And the Whitmanian stanza never seems to end, but finally does, with a girl “boiling her iron tea-kettle and baking shortcake.” Which reminds me, I have to take my pie over to the town pie-judging contest, and I’m not even kidding about that. A buttermilk chess pie. Meine Frau made a peach-blueberry pie. Please see the comments at Anecdotal Evidence, in which the spooky Ghost of Elberry invokes the greatest thistle in literature, to which I will return, sort of, tomorrow. So visit the Arch and the Anheuser-Busch brewery and the amusing and original Citygarden sculpture park. And the misnamed City Museum, which has to be seen to be believed. And, if it’s not too far out of your way, one library, a different one. The St. Louis Mercantile Library, founded in 1846, is, I am told, the oldest library west of the Mississippi. It was founded by merchants, not for them, as a cultural space for working men. Over time, it accumulated a collection of stuff, odd stuff, as well as books. A sign for the Mercantile Library can still be seen downtown, the original building victim of an abandoned renovation. 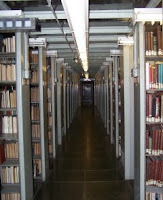 The library itself and every object in it has moved to the edge of the city, to the campus of the University of Missouri – St. Louis, where it now has a space within the university library. The website for the Mercantile Library emphasizes its importance as an archive, which is true, but no reason for most of us to visit. I can find no mention of the peculiar old artifacts. Napoleon’s death mask, for example. Or the marble statue of Beatrice Cenci. Or the bust of Robert Burns, perched atop a custom-made wooden pillar carved with scenes from Burns’ life and poems. Over here is a giant steamship wheel, over there is an original Audubon Birds of America, and farther on is someone’s model train collection, filling eight cases. A chest full of movable type, the Library’s original doors and chairs, a cabinet full of editions of Tom Sawyer. About the only thing you won’t find is a college student! Ha ha ha! The art collection is significant and attractive as well. I borrowed a favorite of mine, a Joseph Vorst, and put it off to the side. Missouri scenes, city scenes, labor scenes, railroad scenes. Maps, too, heaps of maps. I now wish I had taken some photos. The Mercantile Library is worth visiting. The traveler crossing St. Louis on I-44 or I-270 will have to go out of her way by twenty minutes or so. The driver on I-70 goes right by it. Why doesn’t he stop? What’s his hurry? * The coal bin is so large that it is being converted into a theater. How to praise a library? It has a lot of books! The buildings are nice! The above painting of the central branch of the St. Louis Public Library can be found here. Everything in it is an imitation - a ceiling copied from Michelangelo, a floor from Florence, a dome from Venice. Also, a bronze bust of Mark Twain, funded, partly, by Mussolini. The books were the point, of course, and the books are what sustained me. And the CDs, another story. And the toys, and the Xbox games – well, I never checked any of those out, but still, the things libraries do today. Kids don't know how lucky they are. Where was I? Books, books. Because I was teaching during this last year, I had access to almost every university library in Missouri, including Washington University, which was a twenty minute walk from home. I could, within a few days, get anything I wanted. The startling fact, though, was that, aside from university press monographs, the St. Louis Public Library was as likely to have what I wanted. The three Oxford World’s Classics translations of Sergei Aksakov, a hundred year old illustrated translation of the poems of Théophile Gautier, forty-seven titles by Margaret Oliphant, twenty-four by Bjørnstjerne Bjørnson. Not that I ever read any of those, and I’ll bet half are in Norwegian, but now I feel like I should have read some. The Chicago Public Library has, as far as I can tell, not a single book of Bjørnson’s. What? Nobel Prize for Literature, 1903! A few minutes at the keyboard, and a few days’ wait, and any of these books – say a 19th century Blackwood edition of Oliphant’s The Perpetual Curate - would be placed in my hands. Why do they keep all of this stuff? How wonderful that they do. I once asked a librarian – it was because of the Gautier book – if I should really be allowed to leave with it. She said that she had wondered the same thing with books that she had used. I guess they’re not really that valuable. They seem valuable. The central branch of the library, a 1912 beauty that has fallen on hard times, is now closed for a massive renovation. My photograph of the closed stacks is on the left. The one problem with the library was that much of the collection was inaccessible, so mastery of the irritating online catalog was essential. The renovation will make all of this accessible. Note the glass floors! Note the pneumatic tube system (left and down)! 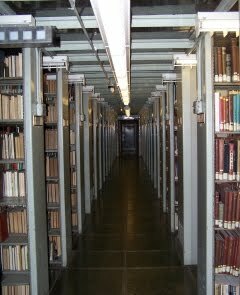 I never requested a book merely to see the pneumatic tubes operate, I swear. All of this will be torn out, a shame but a necessity. St. Louis is a city in which many public institutions – how to say this politely – do not function as they should. The library is an exception, an enormous exception. It’s one of the treasures of the city. Just going by how I have been spending my time, that's what I'll have to write about. Weeding yes; reading no. On Fridays, I'll feature the soon-to-be popular "Is This a Weed?" feature. Anyway, changes are a'comin' to Wuthering Expectations. I can think of two ways to start. Here's the negative one. The libraries in my new home are much worse than what I'm used to. I had quick access to nearly anything I needed. I do not, not anymore. So I wonder how that will affect my reading, and writing. Just a guess: my reading will become more American, and more English. And less obscure. The big famous stuff, we've got. Almost everything published by the Library of America. Dickens, Eliot, Balzac will not be a problem; Margaret Oliphant and Segei Aksakov will require an extra step or two. Interlibrary Loan costs $1.25! One could, I know, buy books. I have barely purchased a book for the last four or five years. I hesitate to undo that difficult feat of self-denial and willpower. I will not undo it! Except for that box from Powells that should arrive today, which includes a Margaret Oliphant novel. Except for that. That box contains only books not available at my new library. Since I have known about the move, I have been neurotically checking the online catalog of the new place. This was months before I moved. Absurd. Irresistible. The positive version of this post: my new town has an excellent library. Superb, charming, well stocked, by any reasonable standard. Just not by the unreasonable standard of the libraries in St. Louis, Missouri. What I really want to do is not complain - my complaints are all about dandelions and tree seedlings - but celebrate the extraordinary St. Louis libraries. Wuthering Expectations owes a lot to the St. Louis Public Library. So a little of that this week. For the Amateur Reader, not for Wuthering Expectations. Posting will be intermittent or non-existent until life becomes less kerfoozled. This is one of the weird parts of the book, of which there are a few, that makes me wonder if the standard critical view of Aksakov as a pioneer of so-called “realism” is missing something crucial. There’s something else here, or in the passage on p. 163 where the boy becomes obsessed with the appearance and disappearance of a patch of frost “like a white table-cloth.” Are the aspects of the natural world simply what they are, or is the boy seeing signs of something else? What sort of meaning is he attaching to them? And how does the adult Aksakov, fifty years later, understand the understanding of the boy? The cabbage white should invoke Nabokov, another Proustian writer. I am eager to read Speak, Memory (1967), particularly the earlier chapters about Nabokov’s own childhood on a Russian country estate, against Aksakov, which is now an obvious predecessor. In The Gift (1938), Nabokov’s stand-in dismisses Aksakov for the howlers and blunders in his nature-writing (Aksakov’s first books were actually about hunting and fishing). Perhaps this is Nabokov’s view, but it looks to me like classic misdirection. I would look up the passage, but all of my books are packed. I haven’t even mentioned the section, just three pages, in which the Aksakov family visits an eccentric millionaire who keeps English pigs “each as large as a moderate-sized cow” and has an orchestra play during dinner, the music of which, like the coming of spring, “petrifies” and “astonishes” the little boy. A Russian Gentleman and Years of Childhood are not weird books, mostly. Just these little glimmers here and there. Seem to see – that has to be the truth. Can this possibly be a genuine memory – “no pillows” and new fir planks and the precise location of the reflected sunlight? With the help of Proust, I can guess at the procedure. Imprecise memories, some elements very strong and others impossibly vague, are blended with his mother’s account of his illness (by the time Aksakov is writing, this would also be a distant memory) and a sensory experience, the smell of the resin, available to the author in the present that triggers or shapes or evokes the earlier recollection. Aksakov knew all about the tea and the madeleine. Proust begins Swann’s Way with a version of “how I went to sleep” that goes on for twenty pages and drives off who knows how many readers. Nothing like this Modernist fracturing of the story can be found in Aksakov, which is structurally traditional and sometimes even clumsy, or is deliberately made to appear clumsy to simulate the process of memory. And there’s nothing like Proust’s movement from childhood into adolescence, society, and even old age. Still, when I read about young Sergei throwing hysterical fits, losing himself in books, and attaching himself so strongly to his mother – all surface similarities to Proust, I guess. It’s the underlying projects that really are closely related. Crazy-sounding, I said. D. S. Mirsky made the Proust comparison in 1926, about as early as it could possibly be made. Thanks to languagehat for posting the relevant passage of Mirsky’s essential A History of Russian Literature: From Its Beginnings to 1900. I could go backwards, too. Aksakov had discovered, reading Gogol and Pushkin, the importance of the wash of detail. Clothes, dishes, mannerisms, the colors of a bird or fish – these can in and of themselves be the basis for narrative. I mean, very little happens in Aksakov’s books. He’s just a little kid. Yet everything is so intense for him. If I ever write my memoirs, they will begin when I am two years old and end when I’m three, the only truly interesting time in my life. Astute, or patient, or long-suffering readers of Wuthering Expectations will know that I could push this all straight back to Walter Scott, since that’s where Pushkin and Gogol got the idea. I’ll just file that away for now.